"The new album will be released in Europe on Massacre Records. The album was produced at the Stage One studio with Andy Classen (DISBELIEF, DEW-SCENTED). The new masterpiece will be released as limited edition digipack." 'Reflections', 'Bloodwork', 'Touch Of Hate', 'Suicide Code', 'The Day I Die', 'Fragile Side', 'I Need A Hero' 'Out Of Clouds', 'Scars Of Sorrow', 'Memories'. The 3-piece death/black metal band from Madeira, Portugal have given access to all to download their songs, in an effort to promote their music. Mystic Circle has signed a deal with Armageddon Music. The band is going to play live on the 31st of March at “Bradford Rio”. This will be the last live for the venue. Belgian doom/death band, are going to release their new album “Circadian Rhythm” on April 28th. - 21st of April, Chicago, U.S.A.
- 24th of April, New York, U.S.A.
- 25th of April, Springfield, Virginia, U.S.A. KEEN OF THE CROW, the 5-piece California band, featuring MORGION’s drummer Rhett Davis and bassist Justin Christian, will release their first full length album “HYBOREA” on 19.3.2007. Dark Tranquillity's new video "Focus Shift" from their new album "Fiction" posted online. Amon Amarth's new video "Cry of the Black Birds" which was directed by William C. Schacht,has been posted online. American death/doom metallers FALL OF EMPYREAN are back. They have finished recording of their new demo which contains 3 songs, preparing their audience for the release of their second album “A Life Spent Dying”. The recording of the album has been scheduled for the first 3 weeks of May and will be made by Ryan Butler at Arcane Digital Recording. It will contain 6 songs with 3 instrumentals. Since the band has no record label they may release it by themselves. 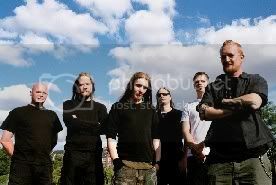 PARADISE LOST are going to release on the 13th of April the first single of their forthcoming album “In Requiem”. The single will be called “The Enemy” and shall be released only in Germany, Austria, Switzerland and Italy. Producer of their album will be again Rhys Fulber (who also produced the previous two Paradise Lost albums) and mixing will be made by Mike Frazer (known for his work with AC/DC. Aerosmith, Metallica, etc.). The single shall contain a trailer of the documentary “Over the madness” which will be included in the upcoming album plus an exclusive non album track called “Godless”. The Danish Doomsters SATURNUS are going out to present their latest work "Veronica Decides To Die" with some gigs that will take place in Germany, U.S.A. and Czech Republic. Band has added the new track "Focus Shift" from their upcoming "Fiction" album to their official myspace page. "Fiction" will be released in April,including bonus tracks of Japan and Australia releases. The limited Dvd includes live performances and video of the song "Focus Shift". Turkish dark ambient project Sanctus Moreor released a debut demo album "Sacred Contradiction" via Extreminal Productions. click here for more information.